Q&A: "Haiti Is Going From Catastrophe to Catastrophe"
NEW YORK, Sep 23 2008 (IPS) - Peasant leader Chavannes Jean-Baptiste has been at the forefront of the struggles of Haiti's peasants for over 35 years. Born in the village of Papay in Haiti's Plateau Central, Jean-Baptiste helped found the Mouvman Peyizan Papay (MPP) peasant union as well as the Mouvman Peyizan Nasyonal Kongre Papay (MPNKP), the latter a 200,000-member national congress of peasant farmers and activists. Jean-Baptiste's role is an important one in a nation where, over the past 50 years, 90 percent of the tree cover has been destroyed for charcoal and to make room for farming, with resulting erosion destroying two-thirds of the country's arable farmland. 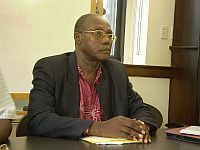 For his work on behalf of Haiti's peasantry, Chavannes Jean-Baptiste was awarded the 2005 Goldman Environmental Prize, sponsored by the Goldman Environmental Foundation, the world's largest prize for grassroots environmentalists. In recent weeks, a series of hurricanes have struck Haiti, killing what is thought to be hundreds of people and devastating the country's already-decrepit infrastructure. The United Nations now estimates that 800,000 people are in need of emergency food aid. Haiti is currently the location of a U.N. peacekeeping force numbering over 9,000 uniformed personnel. IPS correspondent Michael Deibert, who covered Haiti as a journalist from 2000 until 2006, sat down with Chavannes Jean-Baptiste during his recent visit to the United States. The interview was conducted in Haitian Kreyol in Brooklyn, New York, on Sep. 14, 2008. IPS: How badly has Haiti been affected by the recent hurricanes? CJB: It is a major catastrophe. The north of the country was affected, all of the Artibonite Valley, practically every house, every farm, every animal. Flood water passed through Saint-Marc, Fonds-Verettes, Marchand Dessalines, L'Estère, and other towns, and many of those communities are underwater. IPS: The situation for the Haitian peasants before the hurricanes was already difficult, no? CJB: When Hurricane Gustav hit us, the organisations that we have in the southwest told us that most of their animals – goats and cows and such – were affected, that, after being trapped in the rain for 72 hours, they couldn't survive. Many of the animals died like that. I have spoken to people in [the towns of] Jacmel, Caye-Jacmel, Marigot and elsewhere in the south, and they have told us the same thing. In the Grand Anse, the same thing. Hurricane Hannah hit the north of the country, particularly the Artibonite, and the northwest. Hurricane Ike hit the Artibonite and the northwest again, as well as the west. Peasants in Fonds-Verettes have told me that only about 10 houses in the village were not destroyed by the flooding. The focus now is on the town of Gonaives, where those who were hit so badly have been hit again. [In 2004, Hurricane Jeanne killed an estimated 3,000 people in Haiti] Many people who have been displaced from these floods in the Artibonite – 80,000 or so – have now moved on to parts of the Plateau Central such as Mirebalais. IPS: I know that you have worked with the Haitian peasantry for over 35 years. At this time, is the situation for the peasants more or less difficult than before? CJB: The economic situation of the peasantry is more difficult. We have witnessed the degradation of the environment. There is less agricultural production, and people are migrating to the cities, creating slums such as those we see in Port-au-Prince. This adds to the urban population and to the demand for wood charcoal. When you see the environmental situation in Haiti today, it is quite grave, and there is a real need to organise. We have planted 20,000 trees around the country over the last 20 years, but over the same time period some 50,000 trees have been cut down. What seems clear now is that Haiti is going from catastrophe to catastrophe, and they are getting worse as we go along. And that is a direct result of the destruction of the environment. IPS: How would you characterise the relationship of Haiti's recent governments with the peasantry? CJB: We can say that we have never had a government in Haiti that ever changed the problems of the peasantry. We need to create environmental protection and work together, at the same time, in a national framework. There has been a lot of demagoguery, because none of the politicians have had a programme to help the peasants. The politicians and the government are working to implement a neoliberal programme, and the parliamentarians have one preoccupation: To remain in parliament. IPS: How would you characterise the relations and the actions of the international community towards the Haitian peasantry? CJB: Today we are under a military occupation by the international community. There are 9,000 foreign soldiers in our country, with a budget of 600 million dollars to supposedly aid our country. They are there because of the desire of a small group in Port-au-Prince. The United States wants bilateral accords with every country in the region, and the international community – North America and Europe – wants the Haitian peasants to produce agriculture for exportation. And I think these two things are tied together. They give us this aid, and we are to export our food to pay our debt. So we don't have a political situation that favours family or low-production farming. Young peasants go to the Dominican Republic, they go to the Bahamas, or they go to Port-au-Prince, because 80 percent of the Haitian population works in agriculture, but it cannot support them anymore. Our agriculture is threatened by the application of a neoliberal economic programme in our country. The future could be very sad, as well, but it depends on whether or not the people can organise in the country to save the country. Organisations like MPP and MPKNP have a movement, a unified movement, to move forward and address this situation. For example we have a petition that says no to the production of combustible agriculture [agriculture for biofuels such as ethanol] and says yes to the production of food, food for the people in Haiti to eat, not for American cars. We will present this petition in October, and search for support from international organisations for our position, in forums such as La Via Campesina [an international peasant movement headquartered in Jakarta, Indonesia]. We will continue to struggle for agrarian reform to develop Haiti, which is integral if the peasants are ever going to have any kind of security. We will continue onwards with this struggle. *Michael Deibert is the author of "Notes from the Last Testament: The Struggle for Haiti".